Plans for the District 5 PONY League playoffs to start here Thursday, July 24 are near completion and last minute details are all that are needed to see the teams off and running in the race for state and national honors. PONY League teams from Harlingen, Pharr, Edinburg, McAllen, Mission, Brownsville, Weslaco, Raymondville, and Monterrey, Mexico and will compete in the tournament. The announcement, printed in the Tuesday, July 15, 1958 edition of the Brownsville Herald, didn’t strike up much conversation. If anyone knew anything about it, the biggest thing about that tournament was the fact that Angel Macias from the Monterrey team was coming. Macias and his team had just come off back-to-back Little League World Series Championships in Williamsport, Pennsylvania. That journey began when players and coaches alike walked across the McAllen-Reynosa International Bridge “hoping for rides to a small hotel before their first game of the championship tournament,” wrote Jim Morrison for Smithsonian.com. 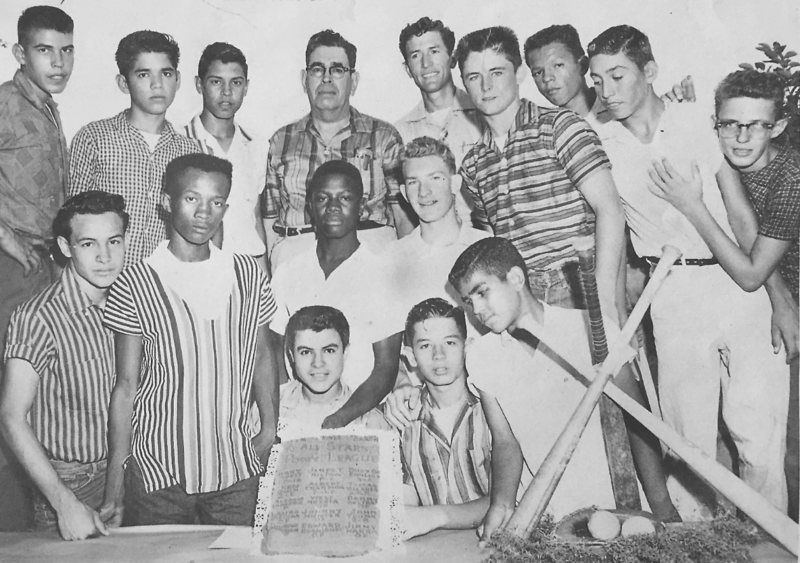 That team was the first non-U.S. team to win the title and in 1957 Macias pitched the only perfect game in Little League World Series history, striking out 11 of the 18 batters he faced. They never counted on what would happen in 1959, now moved up from Little League to PONY League. This time it was Edinburg as underdogs. That squad, 60 years ago, did the unthinkable. They beat Macias, they won the local tournament, coming up through the loser’s bracket and ended up just a few outs away from advancing to the PONY League World Series. Now, 60 years later, Wes Huerta, one of the players on the team has organized a 60-year-reunion. Players and coaches from that team will meet and greet visitors at the Museum of South Texas History from 10 a.m. until noon on Saturday during the museum’s free Saturday morning period. At 11 a.m., a short introduction of the players and coaches will be made. Following the presentation of players and coaches will be a short history of the league, games and the experiences the players and coaches had during the 1958 season. Players, coaches and others will continue the celebration at 6 p.m. at Club Rio, 621 E. Cano St. The first hour will be a mixer, followed by a meal and a program that will share the significance of the reunion and the historical implications of the victory over Monterrey and the rest of that magical summer. The District 5 Pony League Tournament was held in Pharr, and Edinburg opened with a 9-1 victory over Weslaco, sparked by Gary West who not only hit two home runs but also earned the win on the mound and struck out 13. Next, however, came Macias and Monterrey in the double-elimination tournament. True to form, Macias was deadly accurate and Edinburg could only muster a single hit from Bill Bob English. “We just never saw someone who could pitch like him. He threw hard and he could hit either corner and just move the ball around with pinpoint accuracy,” Huerta said. The teams would meet again. West hit two more home runs against Weslaco in the loser’s bracket; Monterrey was up again. With the local team needing to win twice, Macias sat. J.T. Heliton drove in three runs with a pair of homers and Edinburg forced one more meeting with Monterrey – and Macias would take the mound in relief in the fifth inning. Heliton pitched five innings and homered in the game but had to come out based on pitching limits. Alfonso Longoria came in for the final two inning, faced seven batters and struck out six. Macias took the loss, his first to go with 31 wins. The win sent Edinburg to the six-state Region 4 tournament where they repeated what Monterrey did in the district event, going undefeated to the finals before falling twice to a San Antonio team that ended up heading to the Pony League World Series. When all was said and done and the Pony League all-star team returned to a warm reception, it didn’t really know what it had done. It didn’t take long, however, for people to realize it was a special season. 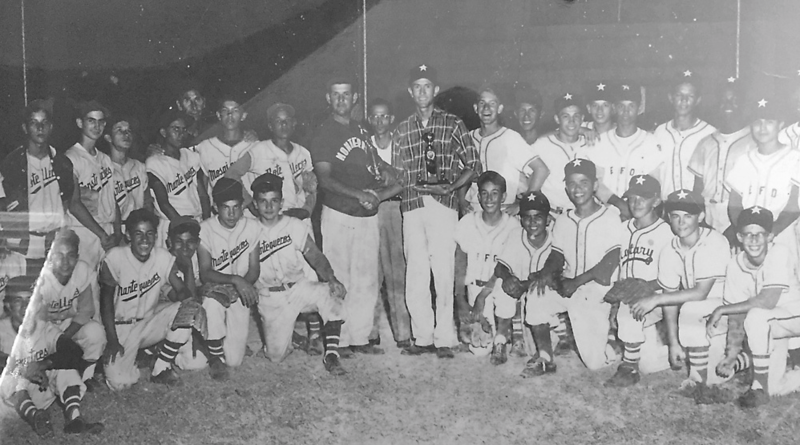 This team, which wore jerseys from four different sponsors throughout the tournaments, was reported as “one of the 16 best teams in the U.S., Canada and Hawaii,” according to the Aug. 18, 1958 Edinburg Review. Those words were echoed throughout the state and region.